Walking - there are numerous opportunities - high level mountain scrambles (or climbs for the more adventurous), or beautiful coastal walks. Nature-spotting - look out for eagles, deer, otters, mewing buzzards; and out to sea, seals, basking shark, minke whales, dolphins, gannets and a host of other sea birds. Bring your binoculars!! Fishing - try your luck in Loch Pooltiel or at Neist Point. Mountain-biking - bikes can be hired in Portree. Horse-riding - from stables at Suladale or Portree. Eating and Drinking - the world-famous Three Chimneys restaurant is only 3 miles away. The Old School House in Dunvegan is good, as is the Loch Bay fish restaurant in Stein on the Waternish Peninsula. The Red Roof Cafe and Gallery across the valley in Glendale also have live music during the season, there's also Ceiteag's Restaurant in Glendale. Portree has bistros, a curry house, an Italian restaurant and a number of pubs. . Fresh veg, salads, eggs and chutneys are available locally - look out for road-side stalls. Northern lights - look out for the aurora borealis, particularly around the spring and autumn equinoxes. Star-gazing – enjoy star-gazing in some of the best starlit skies in the world – whilst 9 sites on Skye have Dark Skies Discovery Sites status, on a clear night you only have to step out of the door at 6 Fasach for fantastic views of the night sky – bring your binoculars! Neist Point - a 10-minute drive takes you to the most westerly point on Skye. The coastal scenery is spectacular. It’s a superb place to walk and watch diving gannets, beautiful sunsets over the outer isles and, if you’re lucky, dolphins, minke whales and basking sharks. Dunvegan - with its Castle and gardens, coral beaches, seal colony, boat trips, shops, bars and restaurants is 9 miles away. Skye Silver - only a mile up the road, you will find some lovely pieces to treat yourself or buy presents to take home. Galleries - art galleries abound. The ones in Colbost (The Raven Press Gallery), Dunvegan (The Croft Studio, and the St Kilda Gallery), and Stein, to name but a few, are all worth a look. Skye Weavers in Glendale "Come and visit us in the weaving shed! Watch us weave on our bicycle pedal-powered loom and have a browse through the shop". The Colbost Croft Museum - a traditional blackhouse dwelling. Portree - the main town in North Skye with shops, restaurants, swimming pool; and the Aros Centre for RSPB sea eagle nest cams, theatre, music and cinema, art exhibitions and a pleasant restaurant. Talisker Distillery - an exhibition on the history of distilling, and of course a chance to taste the peaty golden liquor! 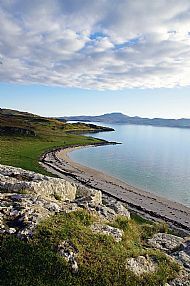 Further Afield - there are numerous places to explore in North Skye. Some examples are the Waternish Peninsula - Fairy Bridge; Stein; Trumpan Church; Skye Skyns: Trotternish Peninsula - Old Man of Storr; Staffin; the Quairaing; Kilt Rock; Duntulm Castle; Kilmuir (Museum of Island Life and Flora Macdonald Monument) and Uig for ferries to the Outer Isles.